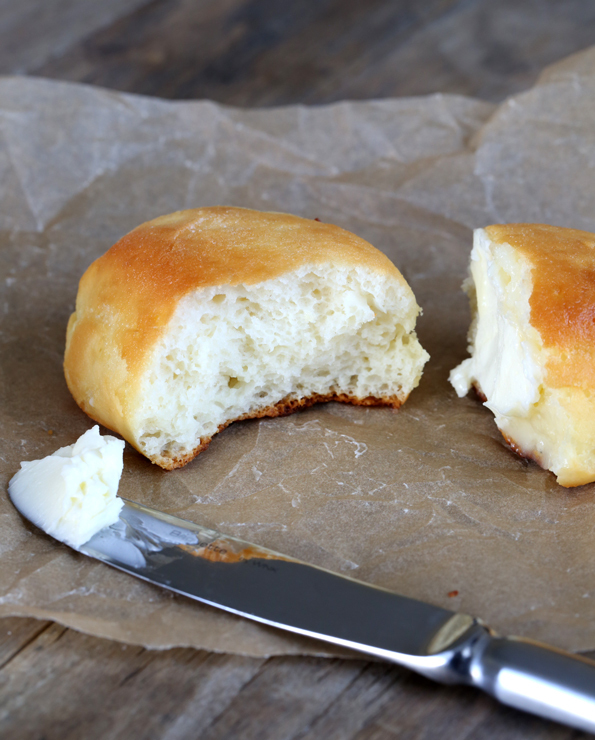 These gluten free Texas Roadhouse-style rolls are as tender, light and fluffy as you remember. But they’re safely gluten free! Up front true confession: I’ve never been to a Texas Roadhouse Restaurant. I looked them up and it turns out that they opened a location right near me. I’d totally be in it for the rolls, though, and since they don’t make them gluten free … well you know how that goes. 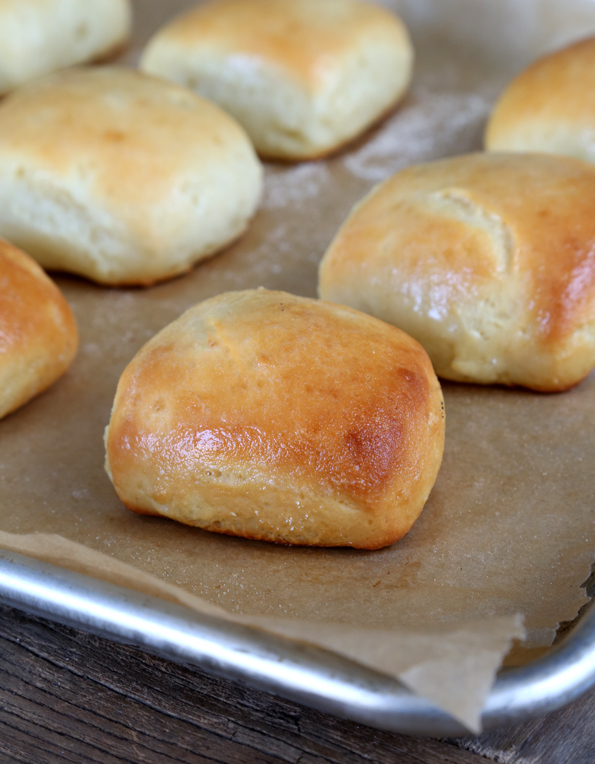 We’ve got to make our own Gluten Free Texas Roadhouse-Style Rolls. Before figuring out which recipe in GFOAS Bakes Bread to begin with as a base for these rolls, I nosed around the Internets for a while to see what others had to say about ’em. The more I looked, the more I decided to do what I had been thinking about doing for months and months: swapping out the pineapple juice in my book recipe for Gluten Free Hawaiian Rolls for milk. With that swap, and a few other tweaks, we have a winner! Now with all the bread I have baked in the last few years, I’m kind of a hard sell on a new roll. I mean, come on. I have so many favorite recipes that shouldn’t it be time to move on to bigger and better recipes? *perhaps* But not until you’ve tried these most tender, light and fluffy rolls. Promise you’ll try these before moving on? 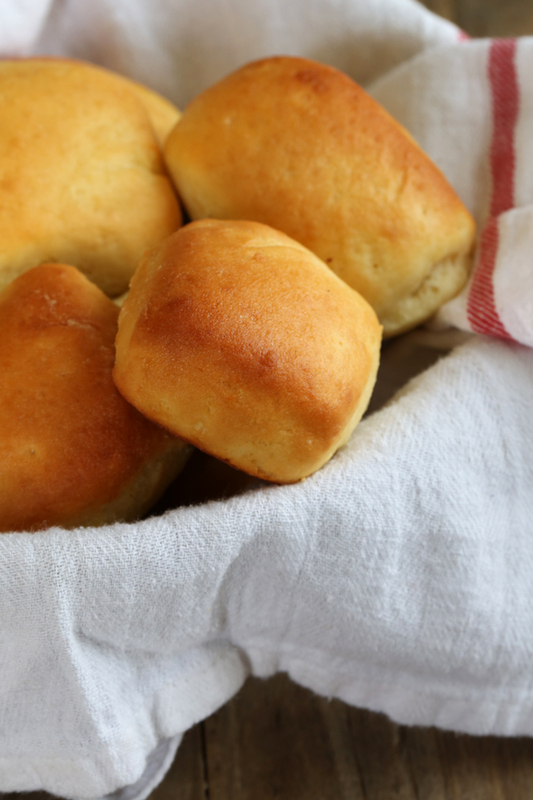 These might just be the dinner rolls to end ’em all. The bread dough, like the others in the style of those in this new style, does better with a slow first rise in the refrigerator. I prefer at least 12 hours for that cold rise. I have also made it in one day, by allowing the dough to rise and then just chilling it a bit in the refrigerator for easier handling. Although the dough is a bit harder to handle and the rise is not exactly as uniform, it still works quite well. The secret to that thin, crackly, buttery crust is to brush the rolls with honey butter both right before and right after baking. And they bake just until the tops are lightly golden brown. The blunt edges on the four sides of these square rolls coax the shaped rolls to rise up instead of out. So they’re just these puffy, sweet little pillows of gluten free bread, like you never thought you’d taste bread again. Eliminate the pure vanilla extract. Preparing the dough for shaping. On baking day, line a large rimmed baking sheet with unbleached parchment paper, and set it aside. Turn out the chilled dough onto a lightly floured surface and, using the scrape and fold kneading method and using a very light touch, sprinkle the dough with more flour and knead it lightly, sprinkling with flour when necessary to prevent it from sticking, scrape the dough off the floured surface with a floured bench scraper, then fold it over on itself. Repeat scraping and folding until the dough has become smoother. Do not overwork the dough or you will incorporate too much flour and it will not rise properly. Shape the dough. On a lightly-floured surface with a floured rolling pin, roll out the dough into a 6-inch x 8-inch rectangle, a bit more than 1/2-inch thick. Using a pizza cutter or metal bench scraper, cut out 12 2-inch squares of dough Each square should have 4 very blunt edges. Place the rolls about 2 inches apart from one another on the prepared baking sheet, cover with lightly oiled plastic wrap, and set in a warm, draft-free location to rise until nearly doubled in size (about 45 minutes, but rising time will vary greatly depending upon the rising environment). Bake. As the dough is nearing the end of its final rise, preheat your oven to 350°F. Once the dough has finished rising, place the 3 tablespoons unsalted butter and honey in a small, heat-safe bowl, and heat in a short burst in the microwave or in a double boiler until melted. Mix the honey and butter together well, uncover uncover the rolls, and brush each generously but carefully. Place in the center of the preheated oven and bake until the tops of the rolls are lightly golden brown (about 12 minutes). 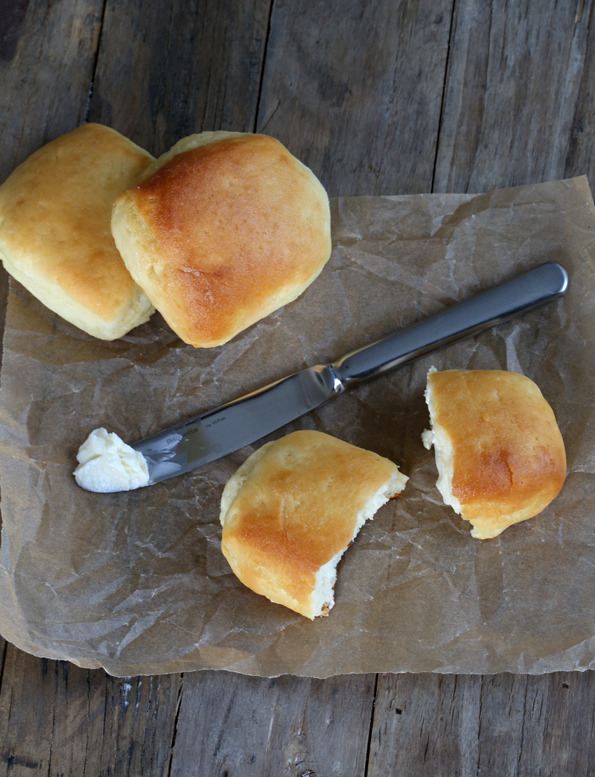 Remove the rolls from the oven and brush once more with the honey butter before serving warm. Inspired by this recipe from Deliciously Yum, as “voted for” by YOU on my Must Make Gluten Free Pinterest board, and adapted from my recipe from GFOAS Bakes Bread for Hawaiian Rolls. P.S. Quick reminder: If you have a copy of Gluten Free on a Shoestring Bakes Bread, and have been enjoying it like I know so many of you have (I love it when you post photos of your breads on my Facebook page! ), would you consider posting a review on Amazon.com? Those reviews are so crucial, and I really appreciate your help! can’t wait to try those!! We love your Hmburger/Hot dog buns so much and use your GFOAS Bakes bread all the time. How ironic. We just ate there the other day, and my fiance turned down having the rolls on the table so I wouldn’t be tempted. Now I can tempt him with some that even I can eat. Thank you oh so much. 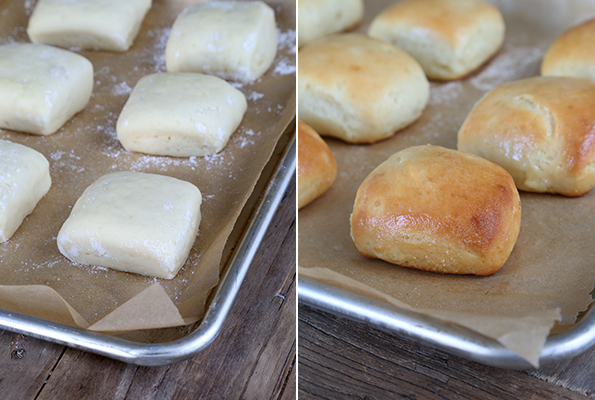 I tried for years to bake the perfect melt-in-your-mouth yeast rolls that everyone would beg for. I finally perfected it and then found out that my husband’s many health issues were attributed to a severe gluten intolerance. Go figure! I just ordered your book and can’t wait for it to get here! They look delicious! Is there a way to substitute the Expandex? I am leary about their process and the use of chemicals which we are trying to eliminate as much as possible from our diet due to some health issues.. Thanks! I’m afraid not, Cyndi. The Expandex (or Ultratex 3 in its place) is essential to my bread flour blend. If you read the label of any processed food you might eat, it will have some sort of modified food starch in it—and a whole lot else. I go away and you post an actual new recipe that looks amazing on a Friday! What a treat! Should I go away more often folks :) ? And now, this! WOW! Happy, happy, happy, happy! Did I tell you how happy I am? As soon as my 10 year old gets home from school, I am showing her this recipe. She and I used to LOVE these when we ate there. We miss the bread, but this totally makes up for it! Thank You! Yep – we ate a whole batch and froze a batch. Yum! I’m definitely making these this week, just not today. It’s housework day :( I love that it uses the Hawaiian Roll Dough. I’ve tried and tried to figure out how to convert that one for my daughter with severe fructose malabsorption, but all the possible substitutions would entirely change the recipe. Now I don’t have to change it to get a roll that she will LOVE! oh man! These look ah-mazing so excited to try them! I used to love them! That’s the best, Stephanie, when the bread love spills over into the next day. Well done! Is the butter in this recipe an addition to the original amount or in place of?